For any other use, see Waltz (disambiguation). 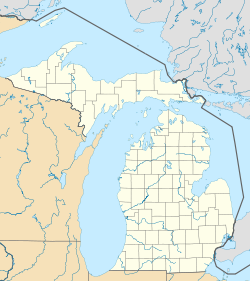 Waltz is an unincorporated village located in Huron Charter Township in Wayne County, Michigan, approximately 25 miles (40 km) southwest of Detroit. The village was first settled in 1857 when Joseph Waltz, Sr., moved his family from Detroit to a 160-acre (65 ha) plot of farmland. The original farm was located along Territorial Road (now Waltz Road) just north of the Wayne–Monroe county line. When the elder Waltz died in 1865, the property was left to his widow Mary, who later deeded it to Joseph Waltz, Jr., in 1867. In 1872, the area was platted as the Village of Waltz. The village later expanded through several additions. Joseph Waltz, Jr., operated a general store on Territorial Road which later became Krzyske Brothers Hardware which remains in operation today. Waltz also opened a German bier garten and hall on Mineral Springs Avenue and Territorial Road, this business remains in operation today as the Waltz Inn. Joseph Waltz, Jr., held many political positions including Huron Township Clerk and Supervisor, Superintendent of the poor for Wayne County and also State Representative. As Superintendent of the Poor, he was instrumental in establishing the Wayne County Hospital at Eloise and as State Representative, he was largely responsible in purchasing Detroit’s Belle Isle Park. The village was located along the Flint and Pere Marquette Railroad where it had its own depot and was a primary producer of charcoal and bricks. Other businesses in the village’s early history included the Waltz Hotel, Waltz Cheese and Molasses Company and the Harbaurer Pickle Company. Although early in its existence, the village supported two churches, the primary center of spiritual and religious learning has been St. John’s Lutheran Church which was founded in the village in 1857. The community continues to exist today located off Michigan’s Interstate 275 at exit 8; the village has a population of nearly 1,500 people. It remains part of Huron Charter Township, although some residents residing in adjacent Ash Township within Monroe County also consider themselves to be Waltz residents. The community is served by the Huron School District. Postal service from the Waltz Post Office ceased in 1954 when a new post office was opened in New Boston. ^ a b Waltz Improvement Association (1972). Waltz Centennial: 1872–1972. Waltz, MI: Waltz Improvement Association. pp. 4, 7. OCLC 52190180. ^ Farmer, Silas (1890). History of Detroit and Wayne County and Early Michigan. Detroit: Silas Farmer & Co. pp. 1311–12. OCLC 82479245 – via Google Books. ^ Scott, Gene (2005). Michigan Shadow Towns: A Study of Vanishing and Vibrant Villages. Livonia, MI: G. Scott. p. 151. OCLC 61731412. This Wayne County, Michigan location article is a stub. You can help Wikipedia by expanding it. This page was last edited on 22 April 2019, at 22:02 (UTC).